Learning through every means possible. I can't get enough information. Quirky, obscure or otherwise, I am a huge consumer of information. I guess that is both a built-in trait and a product of our times. Is it information overload? Maybe. I submit that only happens if the information taken in is not used at all and discarded without true understanding. You are thinking ... where is he going with this ... and you might be on the verge of overload. We were 120 feet up into a Ponderosa Pine in the San Gabriel Mountains on Saturday when I was given tons of information about the different types of evergreen trees in this area of Southern California. We were then strapped into a harness and clipped to a line and zipped 1200 feet across a canyon at 45 mph to a Sugar Pine on the opposing slope. After the excitement of the zip all I could think about was how awesome it was to be able to have this much fun and STILL BE OPEN TO TAKING IN NEW INFORMATION. I am constantly on the lookout for new information. I process it and decide whether it will be useful to me in the immediate future OR to file it away for recall at a later date. None of it is useless. I have known for some time that I am not 'smart' but I do have a decently capable memory bank. I attribute it to head size. I have a huge melon. The point? Keep learning and develop a healthy skepticism. It helps you in both the short and long term. I think true learning helps everyone around you. Yes. I had an outstanding week of training last week. I ran my second fastest 5K on record (20:55). I did hill repeats on the bike on Friday morning and gathered about 1500 feet of climbing in a little over 25 miles. Along with our zip line adventure we stood atop Mount Baden Powell. The trail started at 6500 feet and ascended to nearly 10,000 in a little under 4 miles. 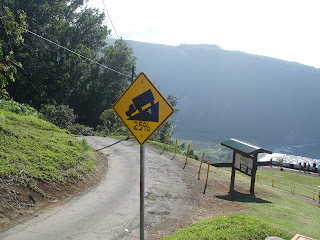 It was steep. It was a great 8 mile workout. This week will include some long and intense bike riding and running. I will swim at least 4 days this week. I already swam 2500 meters today. The Mountain Man 70.3 specialness is on August 12th. I will be ready. My last race as a 38 year old. The air conditioner stopped working on Sunday afternoon. We have called several different service companies and they were all backed up with other calls. Some were backed up as much as six days. The good news is that the unit is relatively new and the motor is covered under warranty. We now believe that we will have cool air in the house again sometime tomorrow (Thursday). In times past, I would have been FURIOUS and "woe is me" about this situation. I must have grown up a bit lately. While I did miss sleep on Sunday and Monday, I realize that in the grand scheme of things it could be much much worse. So we took the opportunity to use the air conditioning at the gym after work this week. I think that has been awesome. We also found a very nice resort with very low nightly prices. (The Orange Tree Golf Resort) It actually might be the nicest room in which we've ever hoteled at 1/3 of the price of the hotel in Hawaii last week. It has been a good week of workouts. Three days in a row of running. Five days in a row of short distance and high intensity cycling. I had a strong swim at lunch - probably one of the top swims I have had in my slow "lunch-accessible" pool. Wow. It's been that uncomfortable kind of hot over the past four or five days. That short period of time in the desert where the monsoons flow up from the south and cause a minute amount of rain, a ton of wind, some lightining AND humidity. It's not the humidity like a 90 percenter back in Kentucky but it is big news when the thermometer has triple digits on it in Kentucky too. I think it is a tie until the heat here goes over 105. We rode a nice long ride on Saturday. It was silly how humid and hot it got. The heat can really zap you if you aren't careful. We stayed hydrated. Yesterday I did a longish 14+ mile run with quite a bit of hills included. I was holding back a bit since it was a training run and SO HUMID. I still ended up running my second fastest 13.1 ever. I averaged an 8:09 pace - even with the hills and the heat. I am very happy with that output. We also saw the movie "Ted". It was funny. It's not a completely AWESOME movie but it has it's moments. The animation they did with the bear is impressive. We hung up a new kitchen cabinet yesterday afternoon - despite the fact that the HVAC stopped working at about noon yesterday. It was 90 degrees in the house all night last night. It finally cooled down to about 86 this morning before I left for work. First of all I am truly sorry for the people involved in this incident. We used to live in Aurora and we know some people there in the area. I hope all of them are safe. I am not going to get into a political debate over guns / no guns. The debate is old, tired and circular. I would like to address the human factors side of this tragedy. Some people are wired a little differently. We, as the 'stable/normal' masses, try to categorize them as "imbalanced" and we treat them as such. We are potentially making the problem worse. For example, if a person has tendencies to be depressed we react by putting them on a series of chemical cocktails to enhance their "mood". The problem is that we create a biological crap-storm within their system and it often reacts in strange ways. Why do we do this? Because we are incapable of dealing with their depression. I am not suggesting that the shooter in the Aurora theater was on any medications. I am simply citing an example of how we tend to manipulate a person's biology rather than have a helpful human relationship with them. I am also not using the whole philosophical "what is normal?" argument. To me it boils down to nice and humane versus cruel and inhumane. What good does it do me to judge someone's behavior or lifestyle if their lifestyle does NOT negatively effect those around them? Being quiet, shy or "backwards" does not hurt anyone SO LONG AS the quiet person does not beat up small animals and push elderly people out into the street at a busy crosswalk. That said - treating people harshly that are different CAN give their persona a violent shove from HARMLESS to mass murderer. We have seen this so many times in the past and yet we refuse to learn. Whether it is triathlon training, work, teaching or family - I always try and be OBJECTIVE and look for the root cause when challenges are presented. Let's do ourselves a favor and look for root causes. If someone in the Aurora shooter's life would have looked deeper into his issues we may have 12 less murders today. I am a speed junky. I always have been and at 38 years old I suspect this speed thing is just part of my core values. Want proof? I love the takeoff on an airplane so much that it often relaxes me at puts me to sleep. I'm strange. You knew that already. Where am I going with this? I need to get my longer rides in and just have them be in L1 and L2. I recently did a 55 miler where I accidentally averaged about 21mph. For an average age group athlete or casual cyclist to go out ALONE and average above 20mph is a good day -- I don't care who you are. I have never done that on this particular route. 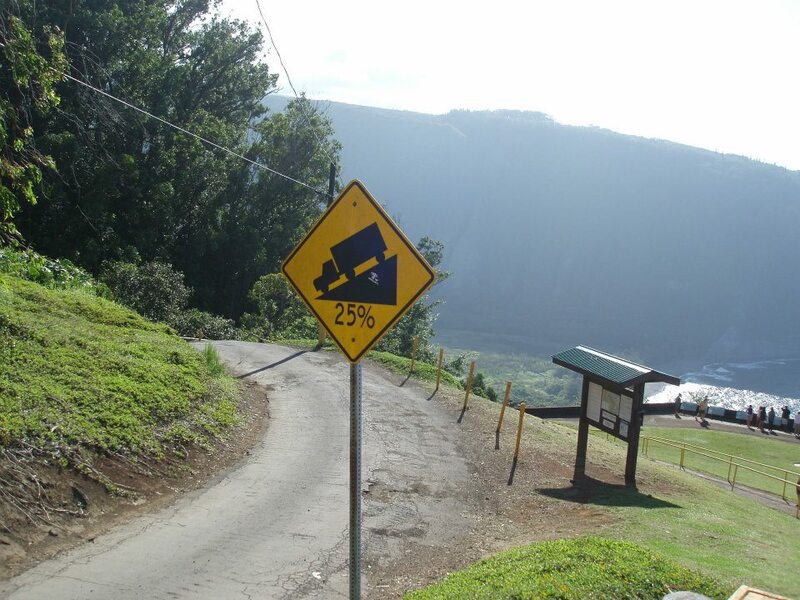 It has about 1500 feet of climbing, so it is not flat by any means. In fact, my previous fastest average on this loop was about 17mph. I know I should be seeing improvement in my speeds, but I don't think they should be jumping this much in a two or three month window during LESSER training volume. There are tons of variables to consider in this ... but one fact remains. 13.1 is not a pleasant experience if you hammer too hard on the 56 mile bike during the 70.3. I've logged about 100 miles on the bike this week and will add more tomorrow and Sunday. I've also had two good 1 mile swims this week. I am working much more efficiently in the water. I am STILL NOT FAST but I will hold my own. I'll trade a little speed in the water for some extra power for the bike and run. We dropped cable about two years ago. We have Netflix. I must admit that Breaking Bad is a clever show. I enjoy it. I am not in support of the premise (making meth) but it does give the public a glimpse of what it must be like to get sucked in to a life of crime. I don't plan on this "going viral" ... but I am not displeased with what they produced. In fact, I like it and I am my own biggest critic. Arizona Pain Specialists has been on my "Team" page on the blog since Day #1. Now they have some video of me telling my story. Here is an article that summarizes all the verbosity of my blog quite nicely. Huge 24 hours of training. A 10 mile run last night, a weight training session, two twenty mile spin classes and a Yoga session. This half ironman in Flagstaff is not going to chew me up. July 11th 1993 - Our first date. July 11th 1997 - Our wedding day. We eloped. Gatlinburg, TN. July 11th 2012 - Our 15 year anniversary. We were in Hawaii on our "delayed honeymoon". We waited a long time to have a REAL honeymoon. It paid off! We spent seven awesome days on "The big island" of Hawaii. Day One: We walked around our resort in amazement at the size and splendor of such an establishment. We also caught a sweet sunset. Day Two: We drove down to Volcano, HI. We saw Kilauea. Scratch that. We walked on the caldera! We hiked all over Volcanoes National Park. It was impressive. Day Three: We snorkeled at Two-Step and Hapuna Beach. Impressive stuff. We also did the Luau at the Hotel. Fun stuff. Day Four: The anniversary. 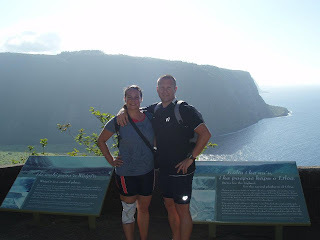 We hiked at Pololu and Waipio. Both hikes were steep. Great views. We ate at Bamboo Grille in Hawi, HI. Day Five: Water day! We swam (distance) in the pool and snorkeled at A-Bay about a mile down from the resort. Day Six: Hilo, HI and Waimea. We hiked. We saw Akaka Falls. We hiked some more. We explored Hilo and ate some awesome Sushi. We capped off the day with a hike and educational tour of Mauna Kea and the telescopes on the summit. 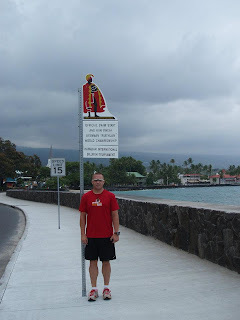 Day Seven: We toured all around Kona. We saw the start/finish line for the Ironman. We ate some good food. Then we hopped on a puddle jumper and flew to the airport in Maui and then grabbed the big jet and flew home overnight. 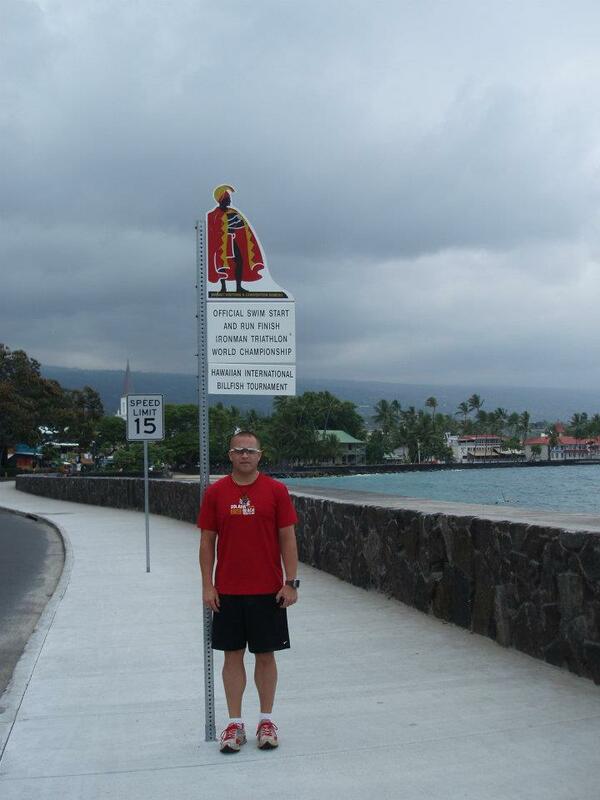 Bryonman at the Ironman start/finish like in Kona. So the 4th of July turned out to be pretty darn good. I did this weeks long run during a cool but humid morning. It was a solid effort. I usually don't train double digit miles so intense - but it felt good and I went for it. I am sure it will pay off in the future. We have been painting in between workout and work sessions. The office is about ready to be reassembled. It has been completely remodeled and updated. We got rid of the carpet in favor of our new stained concrete floor. Carrie added a nice base color and glaze to the cabinets - which now match our office furniture. We painted the baseboards and walls. We also painted the hallway and the newly built closet. Our next painting tasks will be the den, the bathrooms, the guest room and the "mud room". We have painted about half the house thusfar. We are taking our time. It has not been too burdensome. Prior to round two of painting we are going to celebrate our 15th anniversary. I suppose this is our official honeymoon. We are headed to Hawaii. We are stoked. We've been traveling quite a bit over the past couple of months so the anticipation could only start building once the wedding trip was complete. Good luck to all those racing this weekend. I know several people are racing at JCC in Scottsdale. Be safe, stay cool, hydrate and go fast! Last week wound down nicely after a crazy beginning. Thursday became a day off from training. We worked on the house. Friday I trained at lunch and we worked on the house some more. Saturday I rode an interval ride and followed it up with an interval run. We also painted quite a bit on Saturday. On Sunday we painted some more and swam at Bartlett Lake for an hour or so. We also had the opportunity to hang out with some of our rock climbing gang from years passed. Saturday evening was fun to catch up with some awesome people that we hardly see anymore. Funny enough, several of that crew have become cyclists, runners and even full-on triathletes. Yesterday I had a media session with Arizona Pain Specialists. I took my medals and some photos. They also shot some video. They intend to use me as one of their success stories. Back in April and May of 2011 I used them to help me get past a nagging knee injury. Dr. McJunkin applied a steroid injection in my left knee on two different days ... and the second one seems to have done the trick. We'll see what happens. When I get some links I will post them out to get everyone's feedback. Yesterday was a good training day too. I did a mini brick early - an 20 minute and 8 mile ride with high intensity followed by a 1 mile run at a 6:40 pace. I can now run a sub 6 mile pretty easy without a bike session in front of it. I can't get that output after a bike session - but a 6:40 pace after an intense bike session is better than I have done in the past. I will take it. Progress is fun. I am now just competing against myself. It's mentally healthier that way. Last night we did spin class. It was the typical sweatfest but I worked a little more consistently than normal under the load. I paid the for work during Yoga. I was TOAST. I just used it to stretch my hips and calves ... it was still awesome. We also did more core work than normal and I liked that. At lunch today I swam a quick 800m and ran a 5K. I am getting more efficient with training during lunch. Yes, I actually got all this in very close to an hour total. Tonight we are doing spin and Yoga again. That combination is amazing to me. I have used Yoga breathing techniques in several races ... and it helps tremendously. "Liberty is the right to choose. Freedom is the result of the right choice." This blog is about my quest to better myself - and to do a few endurance races along the way. Of course there will be other things mentioned. I promise to keep it clean, relevant, brief and somewhat entertaining. I am a web guy originally from Kentucky but the wife and I have spent much of the last 20 years west of the Mississippi. We are currently back in Kentucky. Aside from my full-time job ... I teach college-level courses and run my own web consulting business. Content Copyright Bryonman -2011 to current,. Awesome Inc. theme. Powered by Blogger.